Wow! Long time no see for Christopher and myself. We haven't seen each other since Chris was five years old and he attended school in Mountain Home. Chris has grown into a handsome man, who loves his kids and wife deeply, and is currently serving in the Army National Guard. His mom Nery and dad Juan were there and to their surprise, I was there to marry their son! It was a big reunion for all of us! The stars all lined up perfectly for me to see Chris and his family again, and to perform the wedding ceremony uniting Chris and Eliza in marriage. Thank you, and many blessings to you all. Mother of the Groom Nery Baez and Vicky - Friends from Mountain Home Almost 25 Years Ago! Small town New Plymouth, Idaho is the home of Shyla's Aunt Darla and Uncle Marvin and where the beautiful garden wedding took place uniting Shyla Houston and Cody Conner. The wedding party really, yes, really, knows how to bring the house down....they danced their way to the altar! The dynamic dancers paved the way for Shyla and her dad to the garden arbor. The music faded, and the couple sealed their vows and their love for one another before a great group of friends and family. Awesome wedding and great couple Shyla and Cody! May you have many years of fun dancing and love songs! Click the YouTube link to watch their amazing dance processional to the altar! Sweet baby girl needed to cool off! Brian and Krista have known each other since childhood and have been friends for a lifetime they said. They said their relationship was just meant to be, and when she came to Mountain Home to visit Brian, she didn't want to leave. They knew, for sure, this is the real deal. Love. After Brian and Krista discovered we live just houses apart from each other, they walked over and were married on the steps of our beautiful, turn-of-the century home. Congratulations to one incredible couple! 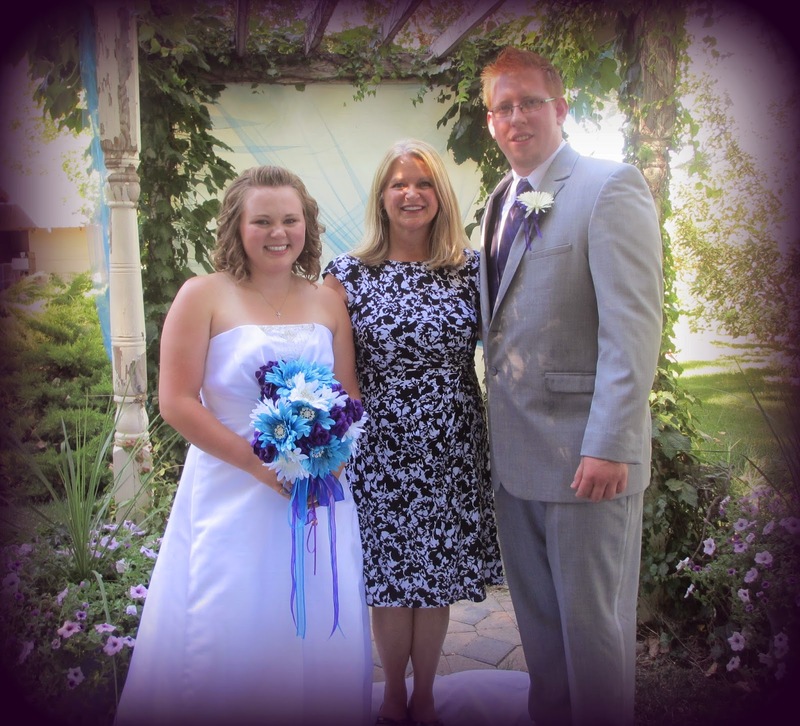 Madison's grandparents have a beautiful home filled with loving memories for Madison, so it was only fitting that Madison and Braeden's wedding take place in the gardens of her grandparents home in Nampa. Madison and Braeden incorporated a Unity Candle ceremony as part of their wedding and it was a beautiful light as they began their new lives together. Thank you for allowing me to join you on your wedding day! Wall Hanging - Leaf Guest Book - So Clever! Bill called me a few weeks prior to their road trip from Kansas on their way to Oregon. Bill told me he and Tamara would be celebrating their 22nd wedding anniversary while they were driving through Idaho, and could I help him find a special place so he and his wife could renew their wedding vows, Of course I said! The kicker - this would be a surprise to his wife until the moment they arrived in Boise. I suggested the Greenbelt on the Boise River, even perhaps the Little White Chapel on the campus of Boise State University. Bill drove Tamara and their three kids to BSU, telling them that he had always wanted to see the Blue Turf, but in fact, I was waiting for them at the Chapel. Was Tamara ever surprised! We started their vow renewal ceremony and there wasn't a dry eye to be had. Tears from them both, their kids and I even had a tear in my eye as I listened and watched this special renewal of Bill and Tamara's love and commitment to one another as they celebrated 22 years of married bliss. Thank you for allowing me coordinate this special ceremony for you. Congratulations on your 22nd wedding anniversary! Michael and Jill were married at the Meridian home of his grandmother on a sunny Sunday morning. Their children stood with them as they joined their families together, and it was a sweet, and meaningful ceremony. Blessings and many years of love and happiness to Jill and Michael!